Golf O Max voucher book is the leading French golf discount scheme, entitling buyers to substantial reductions on green fees and sometimes other services (accomodation and meals, for example) at nearly half the golf courses in France, as well as selected destinations in Belgium, Netherlands, Germany, Switzerland, Luxembourg, Portugal, Spain, Italy and Morocco. All courses mentioned on our website will accept Golf O Max vouchers. The voucher book contains over 1700 detachable vouchers, with discounts ranging from 2-for-1 green fees to 50% off a single green fee, 3-for-2, 25% off, or fixed amount reductions on the advertised visitor green fee. 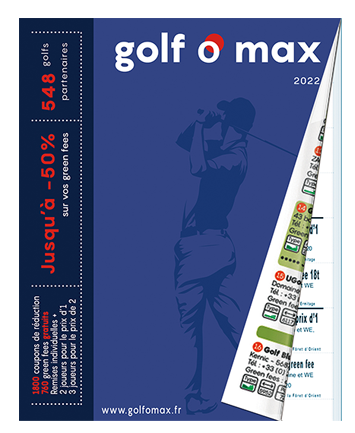 Golf O Max book is in french but this website propose to you a full translation of the vouchers included in the book. Each golf courses offer between 2 to 4 vouchers per book. The 2019 voucher book is valid from 01/01 to 12/31/2019. Golf O Max book and vouchers are printed in French, but don't worry! we provide on this website a coupons translation for your easy reference. Golf O Max book and coupons are not nominative, so you can if you wish pass on your book to friends on your return from France if they are planning a break of their own, to use the remaining discounts. Simply present yourself at the club on the appointed day with your Golf O Max book. Please do not remove the coupons from the book in advance, the club will do this. Coupons that have been detached from the book may not be accepted by the club. After handing over the relevant vouchers, pay the balance of the green fee due (on the basis of the standard published visitor fee) and you're away! If you're a golfer and love to travel, Golf O Max is your ideal companion to help you indulge your passion to the full while saving money, leaving more for shopping, eating and drinking! The average saving across the whole range of courses is almost 34€ per coupon used, so your Golf O Max book can more than pay for itself with just two games! Is there a membership fee to join Golf O Max ? No. You can simply purchase however many vouchers you want at any time. Can we just turn up at a course with our vouchers and play ? No. You must telephone the course in advance and book a tee time. Please ensure you have the book with you, and that the vouchers are not detached before you hand it to the club. Do the vouchers expire ? Yes. The Golf O Max book of vouchers is valid up to 12/31/2019. No refunds, exchanges or replacements can be made for vouchers not used after their final validity date. Are the vouchers transferable ? How many of us can play together under the scheme ? The only limit is the number of vouchers for each course in the book (this is detailed for each individual participating club on the club's information page : discounts / golf courses, so a Society, for example, can order several books to cover all its members. Do I need a handicap certificate to use the vouchers ? Some courses will require this, and may impose a handicap limit, while others are more open. You should check when making the telephone booking. My friend is a member at a participating club. Can I get the discount on a member's guest green fee ? No. Golf O Max is not valid in conjunction with other promotional offers. How much can I save with Golf O Max vouchers ? With well over 500 courses available, this varies very much according to the course you choose to play, the time of year and the time of day, but can be anywhere from a few pounds to the price of a very good lunch! The average saving across the whole range of courses is almost 32€ per coupon used, so your Golf O Max book can more than pay for itself with just two games! How quickly will I receive my vouchers if I order online ? We aim to process all orders within 24 hours, you should receive yours within 10 working days. How often can I play using GOLF O MAX ? There is no limit to the number of vouchers you can use in the 12 month validity period of the book, so in theory you can play all courses in the year, and some of them twice!